With Gold at $10,000 Silver Could Reach $714! So says Lorimer Wilson, Editor of www.FinancialArticleSummariesToday.com and www.munKNEE.com, (It’s all about Money! ), in an article outlining the historical price correlation between gold and silver and what it means for the future price of silver as the gold bull runs it course. Please note that this complete paragraph, and a link back to the original article*, must be included in any article posting or re-posting to avoid copyright infringement. Precious metal bull markets have 3 distinct demand-driven stages and we are now quickly approaching or perhaps even in the very early part of stage which occurs when the general public around the world starts investing in gold and this deluge of capital into gold causes it to escalate dramatically (i.e. go parabolic) in price. History Suggests Gold Could Go to $6,228.80 per ozt. Gold went up 24% in 2009 and 30% in 2010. There are no shortage of prognosticators who see gold going parabolic like it did in 1979/80 when gold rose 289.3% from Jan. 1, 1979 to its peak on Jan. 21, 1980 (and 128% higher in a late-1979 parabolic blow-off of just under 11 weeks)! History Suggests Silver Could Go to $333.33 per ozt. Silver has proven itself, time and again, to be a safe haven for investors during times of economic uncertainty and, as such, with the current economy in difficulty the silver market has become a flight to quality investment vehicle along with gold. The 49% increase in silver in 2009, and 83% in 2010 attests to that in spades. During the last parabolic phase for silver in 1979/80 it increased 732.5% in just over one year. Such a percentage increase from the Dec.31, 2010 price of $30.84 per ozt. would represent a future parabolic top price of $256.74 per ozt. – and from the mid- July, 2011 price of approx. $40 per ozt. would equate to a price of $333.33 per ozt.! (For what that might mean for the future price of gold see the analysis below.) Frankly, such prices seem impossible in practical terms but that is what the numbers tell us. How both gold and silver perform, in and of themselves, does not tell the complete picture by a long shot, however. 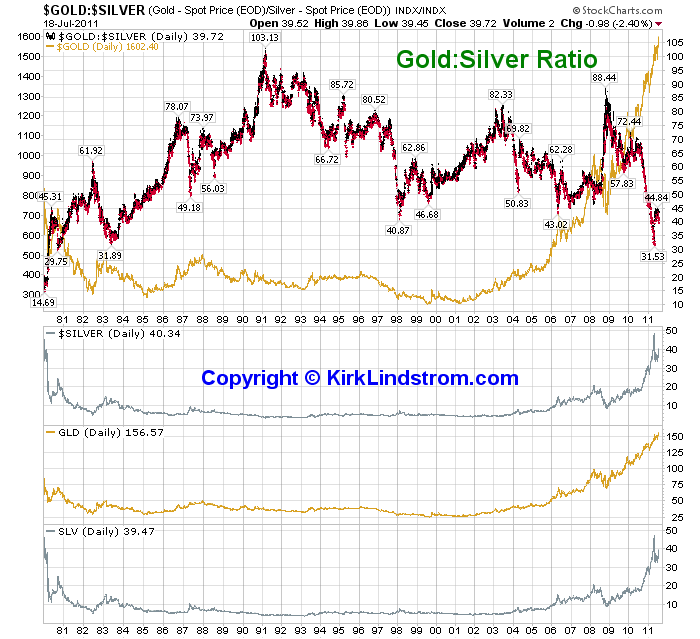 More important is the price relationship – the correlation – of one to the other over time, the gold:silver ratio. Based on silver’s historical correlation r-square with gold of approximately 90 – 95% silver’s daily trading action almost always mirrors, and usually amplifies, underlying moves in gold. With significant increases in the price of gold expected over the next few years even greater increases are anticipated in silver’s price movement in the months and years to come because silver is currently seriously undervalued relative to gold as the following historical relationships attest. Indeed, the move from 78: 1 at the end of 2008 to 65:1 at the end of 2009 to 45:1 at the end of 2010 and to 40:1 in mid-July, 2011 attests to the fact that silver is on the move towards the average long-term historical relationship with gold of 16:1. During the build-up to the parabolic blow-off in 1979/80 the ratio dropped from 38:1 in January 1979 to 13.99:1 at the parabolic peak for both metals in January, 1980. Were the % increases in gold and silver during the 1970s parabolic phase (289.3% and 732.5% respectively) applied to the 2010 year-end prices of gold and silver ( $1,420.70 per ozt. and $30.84 per ozt. respectively) the resultant prices for gold and silver of $5,530.79 per ozt. and $256.74 per ozt. respectively would equate to a 21.5:1 silver to gold ratio. Were the same % increases applied to the mid-July 2011 closing prices of gold and silver of approx. $1,600 per ozt. and $40 per ozt. respectively, the resultant prices for gold and silver of $6,228.80 per ozt. and $333.33 per ozt. respectively would equate to a 18.7:1 silver to gold. Let’s now look at the various price levels for gold and the various gold:silver ratios mentioned above one by one and see what conclusions we can draw. First let’s use the current ball-park price of $1,600 for gold and apply the various gold:silver ratios mentioned above in approximate terms and see what they do for the potential % increase in, and price of, silver. Now let’s apply the projected potential parabolic peaks of $3,000, $5,000 and $10,000 to the various gold:silver ratios and see what they suggest is the parabolic top for silver. The above analyses bears closer scrutiny. In paragraph six it was noted that “During the last parabolic phase for silver in 1979/80 it increased 732.5% in just over one year. Such a percentage increase from the Dec.31, 2010 price of $30.84 per ozt. would represent a future parabolic top price of $256.74 per ozt.” That price is only slightly higher than the $214.29 per ozt. that would result from a 14:1 gold:silver ratio with gold at $3,000 per ozt. Furthermore, as can be seen below, the $227.27 that would result from a lesser 22:1 gold:silver ratio with gold at $5,000 per ozt., and the $212.77 that would result with gold at $10,000 per ozt., strongly suggest that a future price for silver at over $200 is well within the realm of possibility. History will look back at the artificially high gold:silver ratio of the past century as an anomaly caused by the world being deceived into believing that fiat currencies are real money, when in fact they are all an illusion. 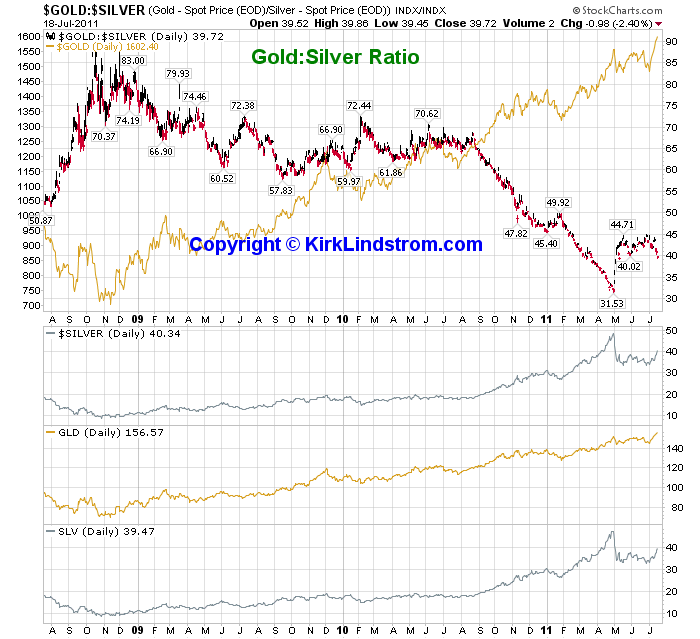 This fiat currency experiment will end badly in a currency crisis and when that happens, as it surely will, gold will go parabolic and silver along with it – but even more so as the gold:silver ratio adjusts itself to a more historical correlation. The wealthiest people in the future will be those who put 10% to 15%  (or perhaps more – much more!) of their portfolio dollars into physical silver today and were smart enough to research and pick the best silver mining/royalty stocks and warrants (see article here ) to leverage/maximize their returns. Indeed, while gold’s meteoric rise still has room to run, silver’s run is only getting started. Certainly, if the historical gold:silver ratios are any indication, it appears evident that now is the time to buy all things silver. You know how in China called the silver? “SILVER – it is OIL 21 st Century!”. Each square foot solar array – it is silver. Each element of the solar battery contains about 1.2 grams of silver per 1 watt of energy. India announced plans to increase its power of solar energy to 20 GW per year by 2020 from zero at the moment. The Chinese have announced plans to raise capacity from 5.5 gigawatts to 30 gigawatts by 2020. And in fact, the U.S. had already announced the same. That’s for you to answer the question why China has previously been the largest exporter of silver, but in 2010, China suddenly found itself the largest importer of silver. fundamentals – what was going on in the world in 1980 made gold/silver advance to their peak prices, NOT CHARTS, LOL i should of kept some of the gold and silver charts back from the 1970’s & 1980’s you would all had a good laugh, fundamntals will take gold/silver to some sort of new high in the years ahead, NOT CHARTS. Unless you get exactly the same situations you had in 1980 you will not get the charts above or peak above. When more and more countries tumble which they will shortly, when more QE is required, when the dollar is abandoned more and more internationaly, when more wars are created, when when when,,,, many whens are coming. It will dwarf the percentage rise of gold in 1980 – that i’m willing to bet my millions on.